We’re all aware of the deal we make when we sign up with Facebook: we get somewhere to post vacation photos and stalk friends, and Mark Zuckerberg gets to sell your passion for fishing trips to fishing equipment retailers. What you might not realize is how deep or extensive the tracking goes—so let’s shed some light on it. Some of the relationship between your actions of Facebook and how Facebook uses those actions for financial gain is immediately obvious: like a page on Coke, and you see more adverts for the fizzy beverage. But less obvious are the ways Facebook joins the dots between the data points it collects, building up a picture of who you are and what you might be interested in—whether or not it’s 100 percent accurate doesn’t really matter, because it can still sell targeted adverts at a higher rate. Take Facebook’s 2014 analysis of which users are in relationships, even if it’s not declared on their profiles. The way your posting frequency sheds light on your life is one of the correlations that Facebook can use—and this was three years ago! The data in the experiment was aggregated and anonymized, Facebook says, but it shows the reach of Facebook’s digital surveillance apparatus. 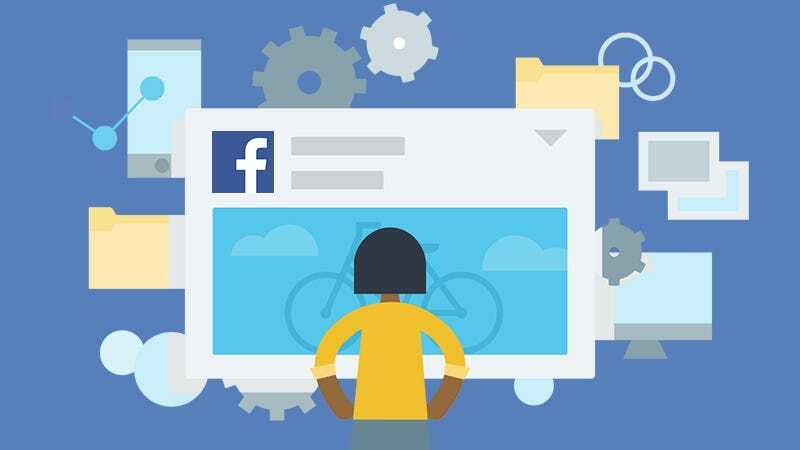 If you want an idea on how Facebook perceives your online behavior and transforms it into tailored advertisements log into the site and visit your Ad Preferences page. Even if you’re careful about the advertisers and businesses you interact with on Facebook, the social network’s range of technologies mean it’s very hard to stay completely untracked as you move about the web. Load up Facebook’s ad policy page and you can learn about some of the ways you might be exposing yourself to eager advertisers—Facebook knows when you share information with a business, sign up for a loyalty program, or even add items to a shopping cart that you then never purchase. As Facebook’s algorithms get smarter, its automated tracking gets smarter too. For example, facial recognition is a handy little AI trick you can use when you want to call up all the pictures you and your best buddy have been in together, but it also means Facebook can now recognize you in photos without you actually having to go to the trouble of tagging yourself, something that’s got the platform into hot water in Europe. “Settings can be complex and while I think [Facebook] does try to provide notices on changes, I believe the typical user ignores it,” adds Spiezle, saying that while these tracking features can be disabled in certain cases, “these all come with a trade off to the user experience” on the network. Which means in order to enjoy the full benefit of what Facebook potentially has to offer you also have to give away much of your privacy. Where you’re going: The big data point Facebook gets when you install its mobile applications is where you are every second of the day. This gives it information on the bands you like seeing, the tourist spots you enjoy, and even the individual stores you walk into. If you’re not happy with this, you can revoke these permissions on Android and iOS. The websites you visit: So many websites and third-party services use Facebook technologies, from Like buttons to login options, that Facebook has a pretty good idea of what you’re up to when you’re not actually on Facebook. If you want to limit how this data can be collected and used, then you need to do some tidying up in your Facebook settings. Your financial status: Even if you never post about your money worries (or joys) on Facebook, it can still build up a fairly good assessment of your financial position to sell on to advertisers. How? By combining data points like your online purchases and where you live, together with records provided by its marketing partners from various sources. Status updates you almost post: Facebook can tell when you’re about to write something and then think better of it, as per a 2012 research paper (though the contents of your self-censored musings aren’t logged). If you’re thinking of making a drunken boast or a barbed comment and then think better of it, Facebook sees your indecisiveness. Apps your friends install: Bad news—apps your dimwitted friends install can gather information you’re sharing with them too. To limit this, go to the Apps section of Settings on Facebook, click Edit under Apps others use, and then untick all the categories of information you’re not comfortable sharing. Alternatively, unfriend the worst offenders. When you’re feeling low: Another trick Facebook’s algorithms can do is make a pretty good guess about when you’re at a low ebb. This is one of the data points Facebook promises it isn’t selling on to advertisers, but it’s a sign of the way all these various social media signals can be combined together to make some revealing conclusions about you. Facebook’s other apps: Even if you barely touch Facebook, the social network can still harvest information about you through the other apps it owns, like Instagram and WhatsApp. If you want to stop this from happening, you can switch off data sharing in WhatsApp, though you’re more or less stuck with it if you’re an Instagram user. Facebook sees everything you do on the platform, though it does offer a decent amount of control over who else can see your posts and who can’t. Sometimes, however, these lines aren’t as clearly marked as you might think—and with a little bit of expert know-how, other people can dig deeper into your profile than you might like. Michael Bazzell collects publicly available online data for his job as a security expert (he’s served as a technical advisor on Mr. Robot), and was able to show us how to check on the big information you might be revealing without knowing it. First, head here, click the Facebook link on the left side of the page, and enter your username into the FB User Name field to get your profile number (a long series of digits). Log into Facebook and try any of the following URLs to see what you (or your friends have been) up to. You can pick up data here that’s not necessarily available through your profile and can even in some cases be seen by people who you’re not friends with on Facebook, as long as the posts are public (here’s where Mark Zuckerberg’s been checking in). If other people can uncover these sorts of results with a few clicks, imagine what’s going on deep within Facebook’s servers. It’s up to you whether you find the services of Facebook (or Google or Apple or Amazon) useful enough to be worth the privacy trade-off—but what’s certain is we’re in a new age of data tracking, one that goes way beyond the information we’re actually aware that we’re sharing.